AgeWell Vision: All older persons will age well in nurturing communities that promote social and emotional well-being and physical health. AgeWell Mission: AgeWell is dedicated to supporting people as they age; reducing isolation and building communities around older persons with and without means, contributing to better emotional, social and physical health. AgeWell is a peer-based wellness program committed to promoting the health and well-being of older persons and keeping them out of hospitals and institutions. The AgeWell model introduces a new way of working that taps into an existing resource for renewed purposes. 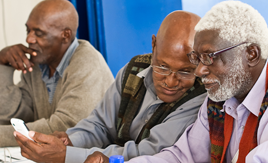 Older persons are not the problem, they are the solution. recommending referrals to existing medical and social service providers.